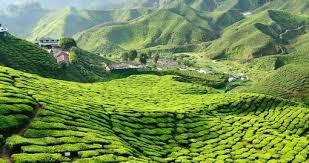 The Cameron Highlands is a district in Pahang, Malaysia occupying an area of 712.18 square kilometres (274.97 sq mi). To the north, its boundary touches that of Kelantan; to the west, it shares part of its border with Perak. Situated at the northwestern tip of Pahang, the “Camerons” is approximately 90 kilometres (56 mi) from Ipoh, roughly 200 kilometres (120 mi) from Kuala Lumpur or about 355 kilometres (221 mi) from Kuantan, the capital of Pahang. It is the smallest municipality in the state. Surveyed by geologist William Cameron in 1885, the outpost consists of three mukims (subdistricts), namely Ringlet, Tanah Rata and Ulu Telom. Its eight settlements are Ringlet, Tanah Rata (the administrative centre), Brinchang, the Bertam Valley, Kea Farm, Tringkap, Kuala Terla and Kampung Raja. All are nestled at elevations ranging from 800 metres (2,600 ft) to 1,603 metres (5,259 ft) above sea level. Developed in the 1930s, the tableland is one of the oldest tourist spots in Malaysia. 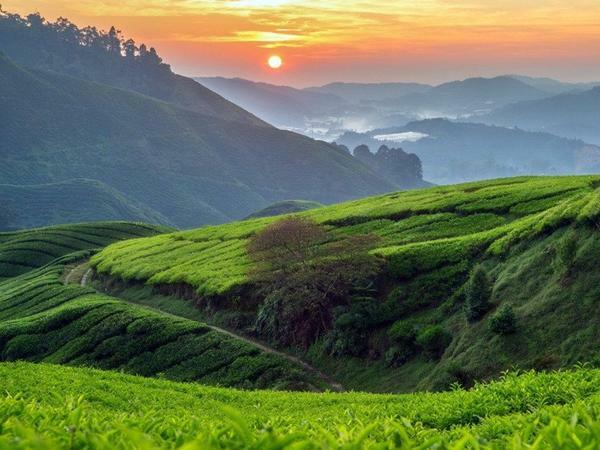 Apart from its tea estates, the plateau is also noted for its cool weather, orchards, nurseries, farmlands, waterfalls, rivers, lakes, wildlife, mossy forest, golf course, hotels, places of worship, bungalows, Land Rovers, museum and its aborigines (Orang Asli.